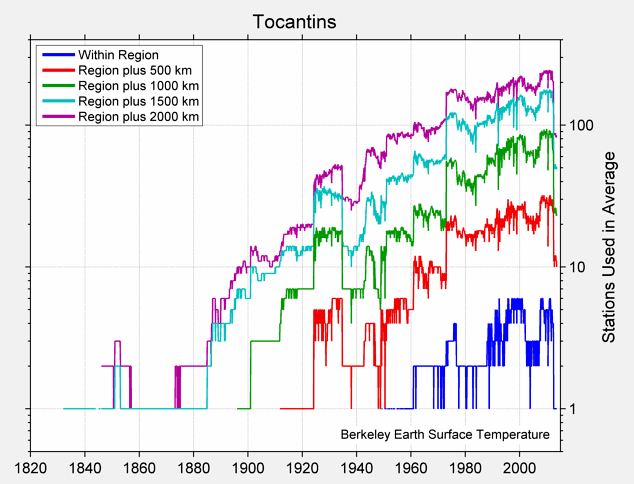 Tocantins ([tokɐ̃ˈtʃĩs]A) is one of the states of Brazil. (From: Tukã´, Toucan + tï, beak. lit. "Toucan's beak" in Tupi language). It is the newest of the 26 Brazilian states, formed in 1988 and encompassing what had formerly been the northern two-fifths of the state of Goiás. Tocantins covers 277,620.91 square kilometres (107,190.03 sq mi) and has a population of 1,496,880 (2014 est.). Construction of its capital, Palmas, began in 1989; most of the other cities in the state date to the Portuguese colonial period. With the exception of Araguaína there are few other cities with a significant population in the state. The government has invested in a new capital, a major hydropower dam, railroads and related infrastructure to develop this primarily agricultural area. Tocantins has attracted hundreds of thousands of new residents, primarily to Palmas. It is building on its hydropower resources. The Araguaia and Tocantins rivers drain the largest watershed that lies entirely inside Brazilian territory. The Rio Tocantins has been dammed for hydropower, creating a large reservoir that has become a center of recreation. Because it is in the central zone of the country, Tocantins has characteristics of the Amazon Basin, and also semi-open pastures, known as cerrado. The Bananal Island (Ilha do Bananal), in the southwest of the State, is the largest fluvial island in the world. Tocantins is also home to the Araguaia National Park, the Carajás Indian reservations, and Jalapão State Park, which is about 250 kilometres (160 mi) from Palmas. There, the rivers create oases in the dry landscape, attracting many ecotourists to the region. Tocantins geography is varied. It straddles both the Amazon Rainforest and the coastal savanna. Many rivers (including the Tocantins River) traverse the state. Researchers have identified more than 20 archaeologically significant sites related to indigenous cultures. Tocantins is bordered to the northeast by the states of Maranhão and Piauí, Bahia to the east, Goiás to the south, Mato Grosso to the west, and Pará to the northwest. 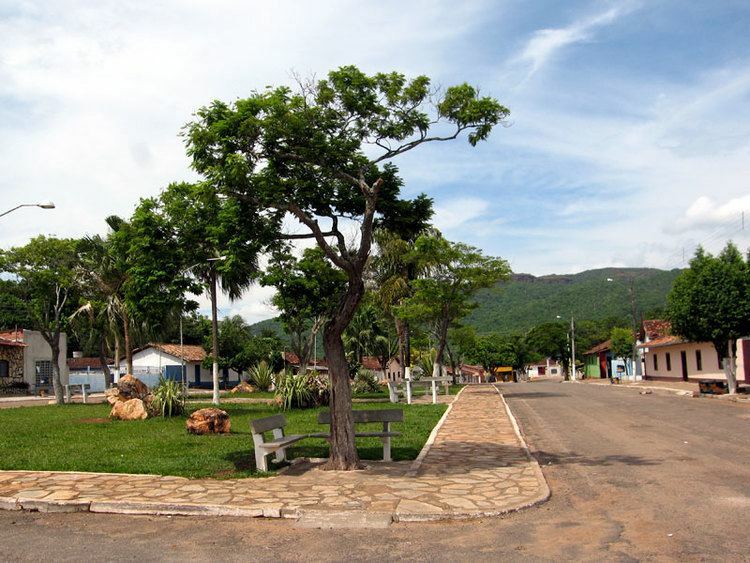 Tocantins was created from the northern two-fifths of Goiás state in 1989 and is divided into 139 municipalities. Most of Tocantins (except the extreme western and northern regions) is situated within a vast Brazilian area known as the cerrado. The cerrado region's typical climate is hot and semi-humid, with pronounced seasonal variation marked by a dry winter from May through October. The annual rainfall is around 800 to 1600 mm. The soils are generally very old, deep, and naturally nutrient-poor. The "cerrado" landscape cover 87% of Tocantins and is characterized by extensive savanna formations crossed by gallery forests and stream valleys. Cerrado includes various types of vegetation. Humid fields and "buriti" palm paths are found where the water table is near the surface. Alpine pastures occur at higher altitudes and mesophytic forests on more fertile soils. The savanna formations are not homogenous. There is great variation between the amount of woody and herbaceous vegetation, forming a gradient from completely open "cerrado" — open fields dominated by grasses — to the closed, forest-like "cerrado" and the "cerradão" ("big cerrado"), a closed canopy forest. Intermediate forms include the dirty field, the "cerrado" field, and the "cerrado" sensu stricto, according to a growing density of trees. The "cerrado" trees have characteristic twisted trunks covered by a thick bark, and leaves that are usually broad and rigid. Many herbaceous plants have extensive roots to store water and nutrients. The plant's thick bark and roots serve as adaptations for the periodic fires which sweep the cerrado landscape. The adaptations protect the plants from destruction and make them capable of sprouting again after the fire. As in many savannas in the world, the "cerrado" ecosystems have been coexisting with fire since ancient times. Initially they developed adaptations to natural fires caused by lightning or volcanic activity, and later to those caused by man. Along the western boundary of the state is the floodplain of the Araguaia River, which includes extensive wetlands and Amazon tropical forest ecosystems. Bananal Island, formed by two branches of the Araguaia, is said to be the largest river island in the world. It consists mostly of marshlands and seasonally flooded savannas, with gallery forest. Where the two branches meet again they form an inland delta called Cantão, a typical Amazonian igapó flooded forest. The Araguaia is also one of the main links between the Amazonian lowlands and the Pantanal wetlands to the south, but the river is not fully navigable. Before 1988 the area made up the northern two-fifths or one-third of Goiás state. Since the 17th century, this area was relatively isolated by rivers navigable only in short portions and mountains, and difficult to access. As a result, the southern area of the state became more developed, particularly after this area was selected in 1956 as the site for the development of the new capital of Brasília and the Federal District. A strong separatist movement developed in the north for independence of its people. After the government levied heavy taxes on mining in 1809, local residents began to organize a separatists movement. They made a minor revolt which was quickly crushed by the army. In the 19th century, a string of failed uprisings occurred in the north. Historically the area was inhabited chiefly by Amerindians in some intact indigenous tribes and pardos of Amerindian and Portuguese descent. In the 1970s, the population of northern Goiás lobbied the government to establish a separate state. In the 1988 Constitution, the State of Tocantins was officially created and admitted as a new Brazilian state. Since its establishment and investment by the government, as in the new capital of Palmas, Tocantins has been the fastest-growing Brazilian state. Its thriving economy is based on agriculture and agro-industry, attracting thousands of migrants from all over the country. The construction of the long-planned North-South Railway (Brazil) will probably boost economic growth even more. According to the IBGE, as of 2014, there were 1,496,880 people residing in the state. The population density was 4.98 inh./km². Urbanization: 71.5% (2004); Population growth: 2.6% (1991–2000); Houses: 355,502 (2005). The last PNAD (National Survey of Households) census revealed the following numbers: 948,000 Pardos (brown, Multiracial) people (68.9%), 330,000 White people (24.0%), 95,000 Black people (6.9%), 2,000 Asian or Amerindian people (0.2%). The service sector is the largest component of GDP at 59.9%, followed by the industrial sector at 27.2%. Agriculture represents 12.9% of GDP (2004). Tocantins exports: soybean 89.2%, beef 10.5% (2002). Share of the Brazilian economy: 0.4% (2005). As with much of Brazil, Tocantins' economy is dependent on cattle ranching. The state's pineapple plantations supply much of Brazil with the fruit, as well as many other Mercosul nations. 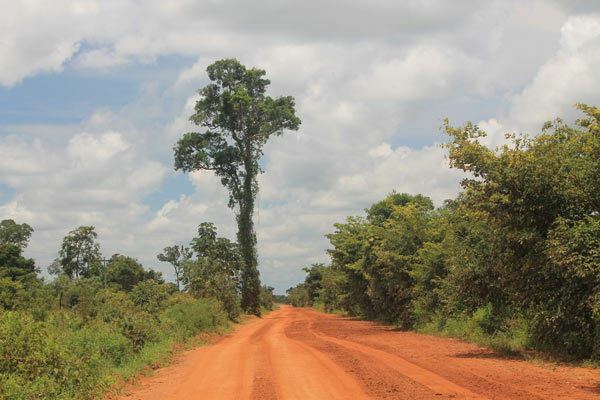 In the state's north, charcoal and oils are extracted from the babaçu palm tree. Seeking to broaden Tocantins' economic base by funding the construction of a hydroelectric dam in the state, the government allowed a private company to construct a sizable five-turbine hydroelectric dam, blocking the Tocantins River to create a reservoir. This construction displaced some indigenous inhabitants. The dam's economic contribution to the state is large: one turbine provides enough power for the entire state of Tocantins, and the remaining four provide electricity that is sold to other parts of Brazil. The facility occupies one of Brazil’s largest airport sites and has privileged location near the Lajeado Hydroelectric Station. Designed with a modern concept of visual communication, the new Palmas Airport Complex contains an Aeroshopping area. This is part of a program developed by Infraero, to develop Brazil’s main airports as commercial centers with their own brand and identity. The passenger terminal has 12.300 square meters of constructed area and capacity to serve up to 370 thousand people a year. It has a food court, cultural space, shops, panoramic deck, elevators, and air conditioning. The runway can receive aircraft the size of a Boeing 767. Three taxiways and aprons are reserved for general aviation, making operations more flexible. The airport's full infrastructure includes a control tower and installations for the Air Navigation Group, fire brigade, a covered equipment parking area, canteen and training rooms, two aircraft fueling stations, a gate with electronic entry control, guard booths, parking and flight protection buildings, besides a 4 km (2.48 mi) access road linking the airport to the Tocantins capital city’s main thoroughfare. Araguaia National Park, established in 1959, is located on Bananal Island. It borders Cantão State Park, and together, these strictly protected areas form the core of the Araguaia Mosaic of Protected Areas, which consists of over four million hectares of state and federal protected areas and Indian lands along the Araguaia wetlands. The mosaic also extends into the neighboring states of Pará and Mato Grosso. Nascentes do Rio Parnaiba National Park is located on the opposite corner of the state, in the transition zone between the Cerrado and the semi-arid Caatinga. It also extends into the neighboring states of Maranhão and Piauí. In addition, the State of Tocantins has established state parks at Jalapão and Serra do Lajeado, protecting two unique samples of the Cerrado. The state parks and protected areas of Tocantins are managed by Naturatins, the state environmental agency. 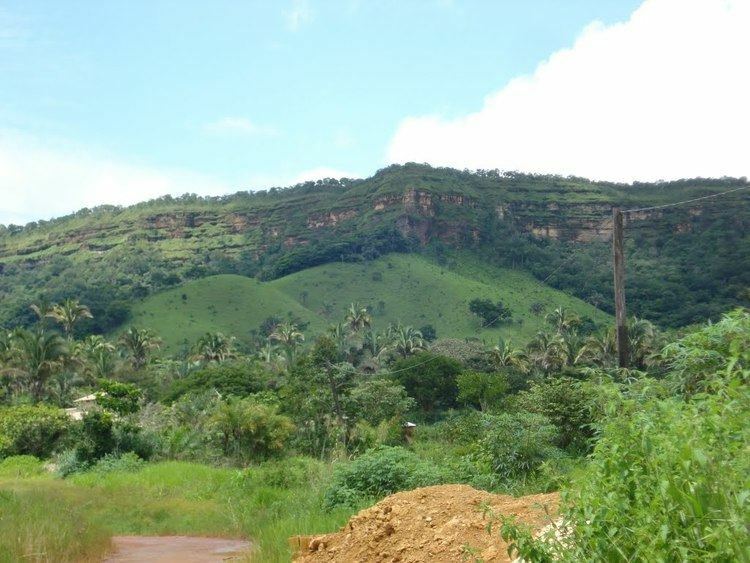 Survivor: Tocantins — The Brazilian Highlands was the setting for the eighteenth season of the United States reality show Survivor, filmed in the microregion of Jalapão in Tocantins. The premiere aired February 12, 2009.